The action at the center of my new book, The Lost Tribe of Coney Island, takes place at Coney Island in 1905 so I have spent the last few years immersed in the place. Researching the incredible attractions on offer at America’s most famous amusement park in the early 1900s I discovered a wonderful fantasy world. Nothing, and I mean nothing, was too spectacular, outlandish or bizarre for Coney in its heyday. At a time when foreign travel was the preserve of the very wealthy, Coney Island offered a tour of the world for less than a dollar. The seaside resort was home to three big amusement parks in 1905 — Luna Park, Steeplechase Park and Dreamland. The three were locked in fierce competition for visitors, and for the most exciting attractions. Visitors who could afford the ten cents entrance fee could stand on the picturesque banks of the Grand Canal at Luna Park’s replica of Venice, complete with gondoliers. Others could travel to the Arctic, or even take a trip to the moon. Coney Island was filled with magnificent architecture — domes, spires, minarets, lagoons, colonnades, and castles. The park managers staged dramatic dioramas of real and imagined events like The War of the Worlds, a spectacle in which miniature versions of the navies of the allied European powers attacked New York Harbor; Twenty Thousand Leagues Under the Sea, a submarine ride to the polar regions; The Kansas Cyclone, and The Fall of Port Arthur. The attractions were designed to take advantage of the public’s fascination with wars, disasters, and distant lands at a time when newspapers carried few photographs. 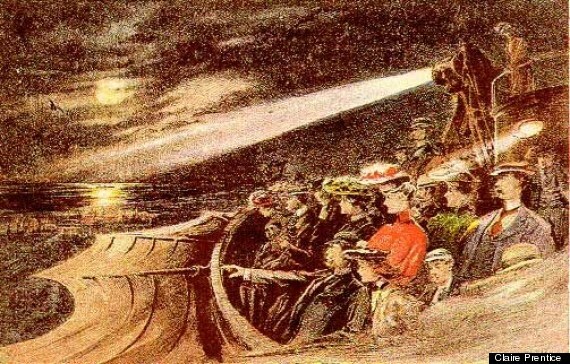 Alongside these expensive spectaculars were the freak shows and human oddities that were Coney’s lifeblood, together with the animal shows, thrilling rides, and displays of exotic human beings from far flung corners of the globe, such as the Igorrote tribespeople whose extraordinary experiences at Coney are explored in my book. Luna Park’s most popular attraction during the 1905 summer season, the Igorrote Village was home to fifty g-string-wearing Filipino tribesmen, women and children who were advertised as “head hunting, dog eating savages.” The lived in a mocked up tribal village, where they presented a sideshow version of their native customs — singing, dancing, performing sham battles, fake weddings, head hunting dances and funeral rituals. But the most popular feature of their show were their daily dog feasts. Dogs were brought to them from the New York pound which they slaughtered before the crowds then cooked in a big pot. At Coney Island they couldn’t carry out their custom of hunting human heads so they had to make do with building a head hunting watch tower. The Igorrotes were not the only foreigners on display at Coney that season. A Somali Village was there too, and even a group of Irish farmers. One of the oddest attractions in a resort filled with the bizarre was The Fatal Wedding, a five-cent show in which a lovely young woman in a bridal gown and veil with orange blossoms in her hair walked behind a screen, only for herself and her beloved to be transformed into skeletons who were then served a sumptuous wedding feast. “Freak shows” and “human oddities” were a staple of Coney Island and among the most famous of them all was “Baron Paucci, the Smallest Perfect Man.” Said to be just two-foot-tall, Baron Paucci wore smart suits and a derby hat, drank champagne, bet on the horses at the Coney race track, and considered himself a great romeo. Visitors entered this popular attraction to find a marching band leading a parade up the street. Moments later, a man came running out of a hotel screaming “fire” at the top of his voice. Cue an exquisitely choreographed presentation featuring one thousand performers. 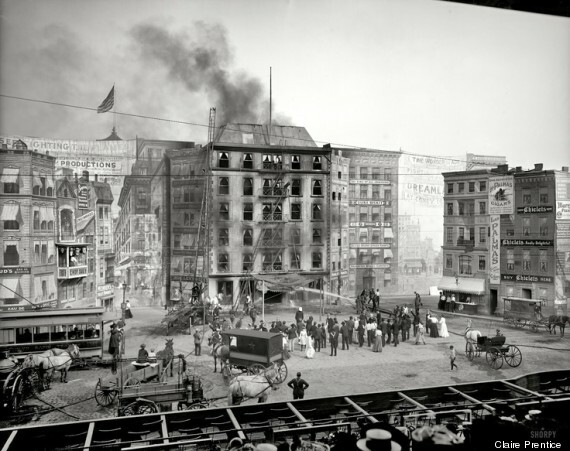 Alarm bells clanged and horse-drawn fire wagons rushed to the scene of a blazing six-story building. On the opposite side of the specially-built fake street, firefighters battled to overcome the (real) flames while men, women and children (all actors paid to take part in the staged event) jumped from the windows into nets below. Created by Ohio-born inventor L. A. Thompson, the Dragon’s Gorge opened in 1905. For ten cents, it took passengers on a six-minute scenic railroad ride to the North Pole, past icebergs, a real polar bear and real Eskimos (especially imported from the Arctic) paddling about in canoes on a small lagoon, then on to the Orient, and the dizzying heights of the Rocky Mountains. En route, it visited Havana Harbor the morning after the February 1898 destruction of the USS Maine, a crucial milestone on the road to the Spanish-American War. One of Dreamland’s most popular attractions, Midget City, or the Lilliputian Village as it was also known, was a miniature town populated by little people, in which everything from the vehicles to the houses to the furniture, was built to scale. Samuel Gumpertz, the manager of Dreamland, scoured America and beyond looking for three-hundred little people to fill his attraction. The villagers lived onsite and performed their own miniature circus, opera and theatre acts and had their own police and fire departments. The most famous and longest running attraction at Luna Park, it simulated a space flight using a clever combination of electrics, scenery and lighting effects. Passengers paid a dime, and entered a cigar-shaped “spacecraft.” The spacecraft’s huge wings began to beat and the craft lurched forward with a whooshing sound, thanks to a system of gimbal bearings under the deck which imparted a rocking motion. Powerful dynamos operated the wings and propellers. Through the windows, images of Coney Island receded into the distance to be replaced by clouds. Moments later the spacecraft touched down on a papier-mâché lunar surface pocked with craters painted red, yellow and green. There fairgoers were greeted by miniature moon men and women singing “My Sweetheart the Man in the Moon” and handing out chunks of green cheese. A large-scale recreation of pivotal moments in the 1899-1902 Boer War, this spectacle featured 600 actual veterans from the recent war in South Africa, plus another 400 local men. Fifty-eight artists were drafted in to paint scenery on hundreds of yards of canvas. Every day the veterans and actors performed a huge mock battle, complete with guns and canons, to packed crowds in a 12,000-seat stadium. 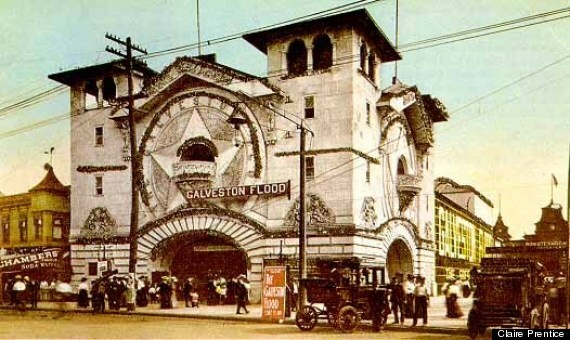 Clowns and little people herded fairgoers across the stage of this attraction with electric cattle prods while jets of air blew the women’s skirts and dresses up around their waists to the delight of their fellow, mostly male, patrons. The men got off relatively lightly, losing only their hats. A favorite prank was for the clowns to hand a woman exiting the attraction a pair of prop bloomers as though they’d just blown off. Nothing was off-limits at Coney including this natural disaster which had occurred only a few years earlier, killing more than 6,000 people. The mechanical cyclorama dramatized the flood using miniature replicas of the city and harbor, which were destroyed before the audience’s eyes — devastated by an ingenious combination of water, large sheets of painted fabric, lighting and mechanical trickery. Claire Prentice is the author of The Lost Tribe of Coney Island: Headhunters, Luna Park, and the Man Who Pulled Off the Spectacle of the Century.